Sissy’s Southern Kitchen & Bar is one of the newer and more notable restaurant openings in Dallas in 2012. Billed as a Southern Kitchen the focus here seems to be on Deep South and Low Country offerings such as Shrimp & Grits, Red Rice, Low Country Gumbo, Fried Bass and the ever present Southern Fried Chicken. All of the standard southern café offerings are present including Chicken Fried Steak, Short Ribs and Rib eye steaks. Daily specials are typically offered as well. We arrived about 15 minutes early for our 6:30PM reservation and were asked to wait in the lobby until the remainder of our party arrived to be seated. We chose instead to have a cocktail while we waited at the only two seats available at the bar. The rest of our party showed up within a few minutes and they were immediately seated at our preset table that was already waiting on us while I was left to square the bill at the bar. We started our meal with a couple of orders of the Squash Puppies ($7.00). This take on Hush Puppies consists of a fried cornmeal and squash hush puppy served with whipped Texas Honey Guild butter & jalapeño jelly. This appetizer was my favorite dish of the evening. It was moist and flavorful in the middle, crispy and flavorful on the outside. The butter was very good and the jalapeno jelly was a great twist. Beware: the jalapeno jelly is quite hot. I could still feel the burn on the tip of my tongue 15 minutes after sampling it. 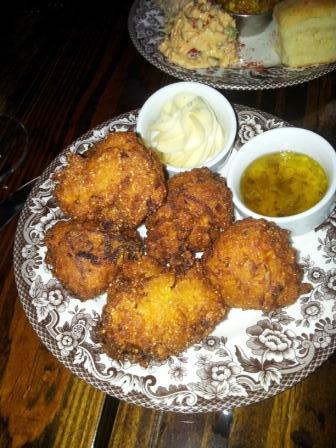 This appetizer is recommended. My entrée for the evening was the Gulf Shrimp N’ Grits ($18.00). This classic Deep South dish consists of roughly a half dozen of boiled Gulf pink shrimp served on top of Homestead Grist Mill grits. 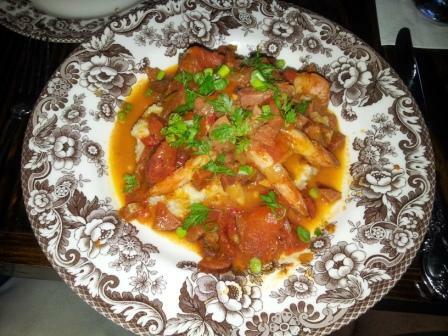 This dish is topped with a sauce of tomatoes, piquillo peppers, Tasso ham & onions. Although the serving size of this dish was ample I found the seasoning lacking. Absolutely nothing in this dish stood out from anything else. It was a “meld of mild flavors” to coin a phrase. At the price point on the menu I’d recommend passing on this dish in favor of some of the other offerings on the menu. 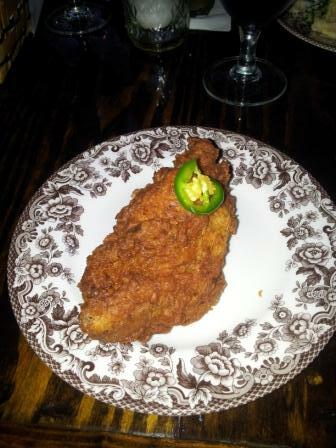 Early buzz suggests Sissy’s is known for their Southern Fried Chicken. You can order an entrée of two pieces of chicken for $11.00 or a bucket of eight pieces of chicken for a mere up charge price of $20.00. I assume Sissy’s does this to encourage tables to order buckets of chicken to share. On the opposite end of the spectrum you can order a single piece as an add-on to an existing entrée; something I chose to do. I ordered a single chicken breast ($5.00) to sample this signature entrée. I found the chicken crispy on the outside and moist on the inside. Seasoning was OK; not particularly outstanding or worthy of special note. Of the three entrees I sampled I would definitely recommend the fried chicken out of the three. I did manage to taste a small sample of the Pan Fried Striped Bass ($24.00) courtesy of one of my dining partners. It was definitely bass; as in it was “fishy” tasting bass. I wouldn’t risk ordering this for myself in the future, especially at the high price point. This is too much of a risk in my book. I did manage to sample one side with my dinner; the Sissy’s Mac & Cheese ($8.00). Although this side is creamy it is fairly bland in flavor. The bread crumbs on top added an odd texture to the dish. If you’re fond of cheesy macaroni (i.e. plenty of cheddar) this is not your style of macaroni and cheese. 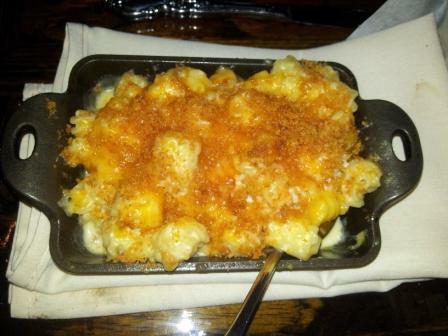 This is more along the lines of Velveeta macaroni and cheese with some bread crumbs tossed on top. I might order this again in the future but next time I would seek out other sides to try first. Sissy’s does not allow BYOB. They have a mixed beverage permit which does not allow BYOB under state law. The wine list is fairly short but with some decent variety. Selections are mostly uninspiring and overpriced at close to three times retail; even more in some cases. Stemware is OK; nothing special. Sissy’s is open for dinner Monday through Friday from 5PM until midnight. Attire is trendy casual. Complimentary valet parking is provided. If you are sensitive to loud noises please note that the noise level can go from a dull roar to ear piercing loud in a matter of 15 minutes. On the surface it looks like Sissy’s practices “flip that table” targeting roughly three seating’s per table per evening. I only mention this because our reservation seemed to be at the end of the first seating window (6:30PM, we had a table of 8) and the sound level was bearable at that time. However, by the time the second seating began to flow in (closer to the 7:30-7:45PM mark) the bearable noise level went to unbearable in a matter of minutes. I literally could not hear anybody sitting directly across the table from me by that point in time. Sissy’s: Decent food but fairly expensive for what you receive. Proceed with caution is my recommendation.